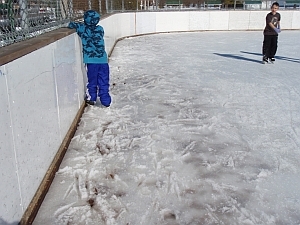 Here are some excerpts from rink diary entries that give an idea of why rinks in March are often either unskateable, or even if the ice is half-decent, empty. Note that the angle of the sun, not the temperature, is the major player. 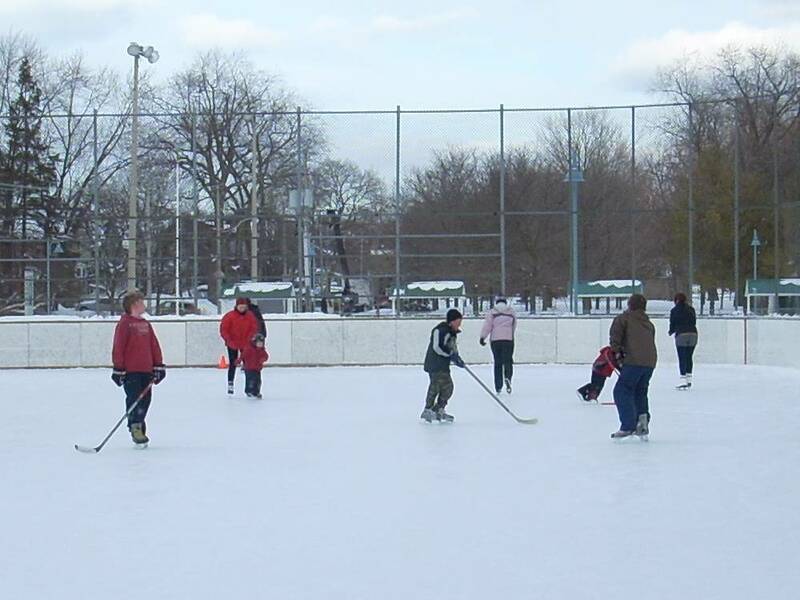 See Outdoor Rinks And Weather for details. 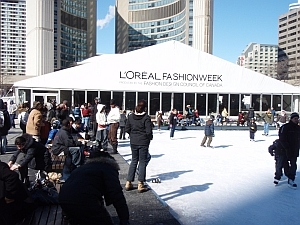 2:45pm There are 14 skaters on the ice and ten people standing or sitting by the side of the rink. Large sections of the ice are soft and slushy. 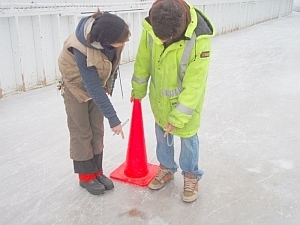 When the CELOS researcher starts skating, he finds it's impossible to make a complete circuit of the rink because so much of it is soft. Some of the other skaters aren't actually skating. They are just standing and talking. 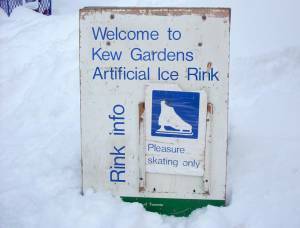 The ice surface is not suitable for skating. 7:40pm Twenty-five people are skating on the ice that was cleaned by the Zamboni a little while earlier. There are more people standing at the side of the rink. Some of the people on the side are parents watching their children skate. 7:15pm The Zamboni, an Olympia, is scraping the ice, which is snowy and soft along the edges, but otherwise skateable. 15 people are waiting on the benches by the side of the rink: 3 adults and 12 children. Some of the children are playing in a snowbank. 3:30pm There are 60 people on the ice and another 60 or so sitting on the benches on the side. There is water on the ice and slush along the edges. 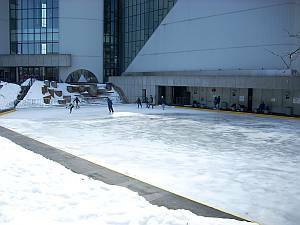 When the CELOS researcher goes for a skate, he finds that most of the ice is hard, but very bumpy. You can skate but it's a rough ride. 3 pm About 30 - 40 people on the ice, many others sitting nearby. Lots of youth. The ice looked fine except for right at the edges and in the one corner where the sun shone -- almost all the rest of the rink was in shade because of the tall hotel across the street. 6:20pm There are forty people on the ice. Another twenty are sitting on the benches by the side of the rink. 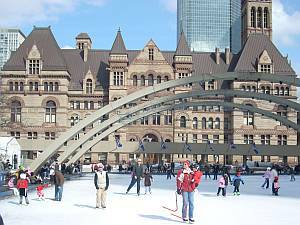 The ice is snowy and is melting in the corners, but people are able to skate without any problems. 3pm There are 60 people on the ice. Many are small children. The ice looks good. 1pm City workers are using a Zamboni and a front-end loader to clear the snow off the ice. 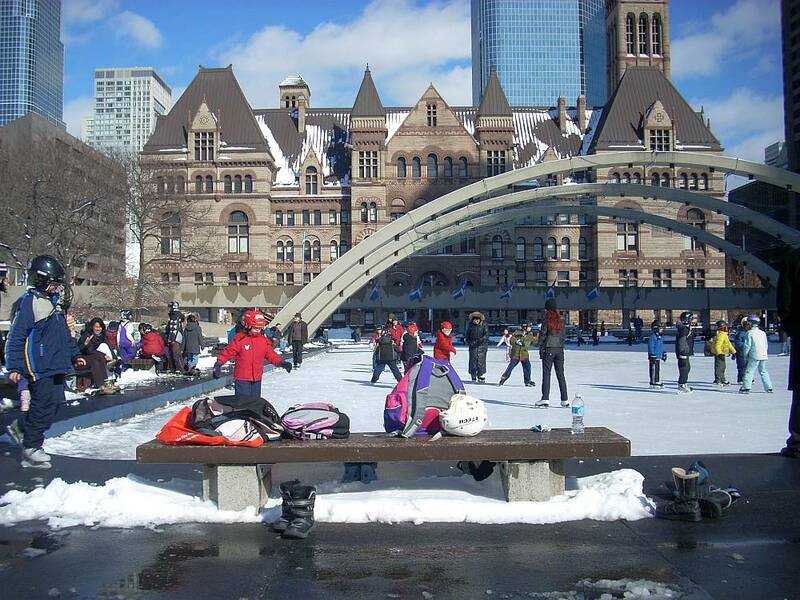 A large group of children are sitting on the benches waiting to go on the rink. 4pm Much of the rink is a lake. Three Harbourfront workers are using shovels in a vain effort to push the water into the drains at the side of the rink. 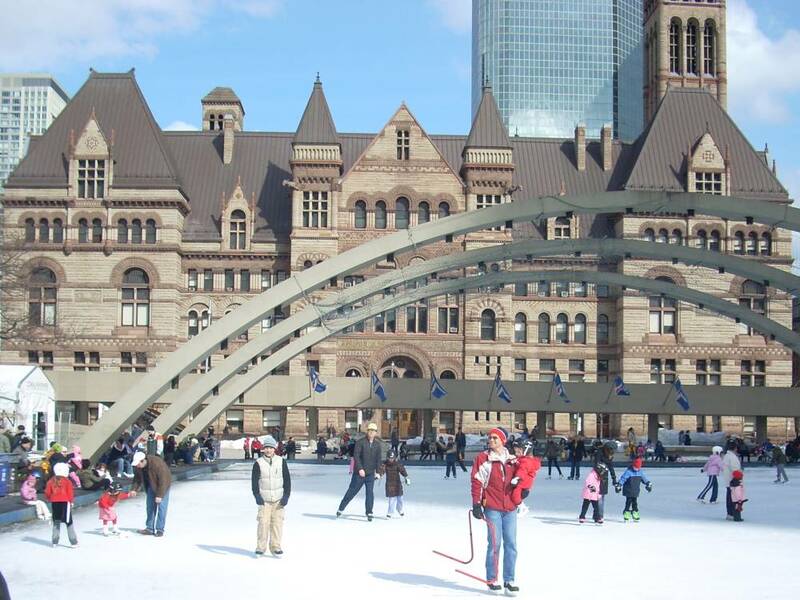 Even though the ice is in bad shape, there are 20 people skating. 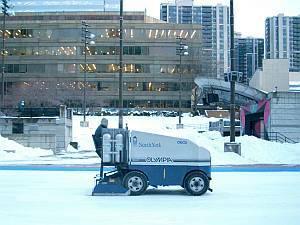 At 4:30 skaters are asked to leave the ice so that the Zamboni can clean the ice. The Zamboni, however, can't do much except stir up the water that covers the ice. When it's through, the ice looks the same as before. 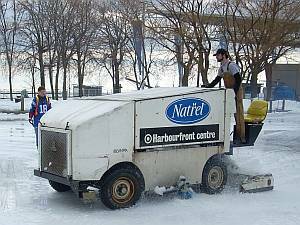 One Harbourfront worker stays on the ice with a shovel. The 20 skaters go back on. 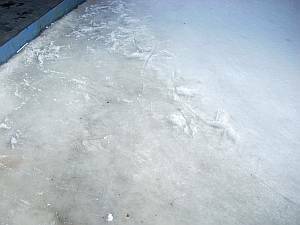 When the CELOS researcher puts on his skates, he finds that some parts of the ice are mush. He nearly trips when his skates hit a soft spot. The workers seem to understand how bad the ice is. Before the Zamboni came on the ice, one of the workers made an announcement on the public address system asking the skaters to leave the ice. After making the announcement, he made another mock announcement to a co-worker: "Skaters please go home. The ice is slush and it's not going to get any better." 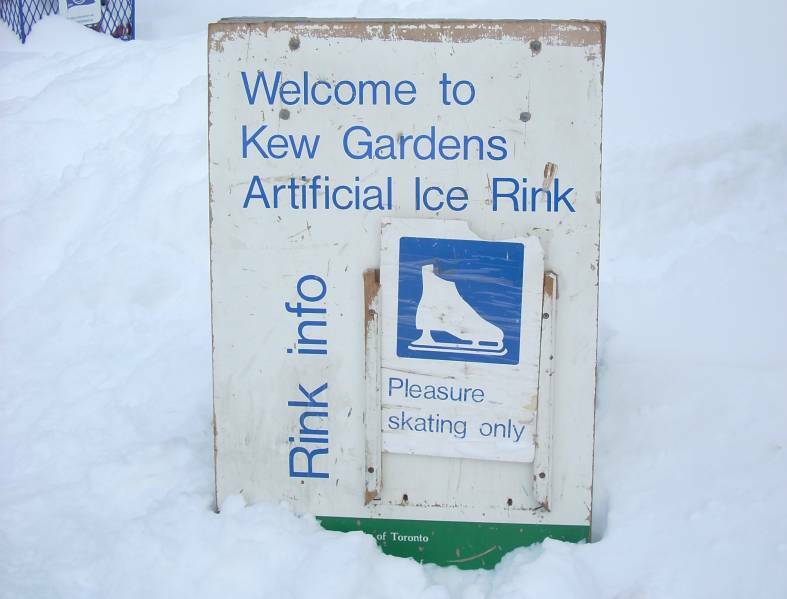 5 pm: the pleasure-skating pad is unskateable, with two chairs set out and a sign suggesting that skaters could come back in the evening. The hockey pad has the nets pulled forward and pylons along the south-facing ice, but a good game of parent-child shinny hockey with 12 players. The zamboni operator says there were 30 people playing shinny a short time before, but they left when the ice got slushy. 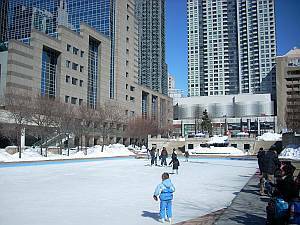 He says the skaters know to come out in the mornings and evenings when the sun shines in late winter, especially in March. 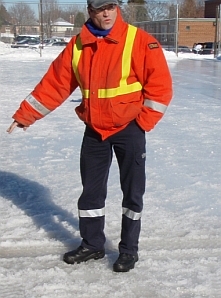 He points out the school and an office building just to the west, both of which give a bit of extra shade to the hockey rink so it's able to stay open when the pleasure-skating rink is toast. 4pm When CELOS arrives there are 11 people on the hockey pad. Nine are adults who aren't wearing helmets. 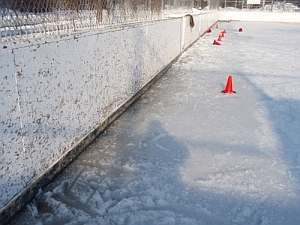 Most of the ice surface looks good, but there are pylons along the edge of the boards on the north side of the rink. They weren't there when CELOS visited the rink two hours earlier. Shortly after CELOS arrives, the players leave the hockey pad so that the Zamboni can clean the ice. There are 5 people (parents and children) skating on the pleasure pad. About a third of the pad is too slushy for skating and there are pylons to keep people off. Although there aren't many people skating, there are another 20 sitting on the benches by side of the rink and 15 more in the dressing room. 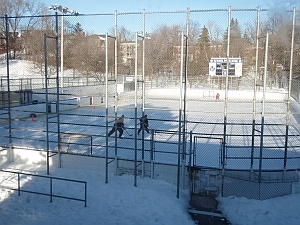 1:20pm There are five people playing shinny on the hockey pad. Two are women. No one is wearing a helmet. The ice looks good. There are another five teenagers on the pleasure pad. There's also a child wearing a helmet with a cage mask. 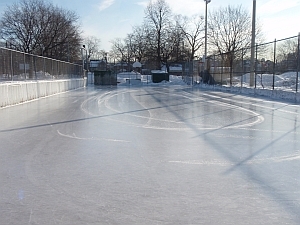 The ice looks soft along the sides, but most of the surface is skateable. 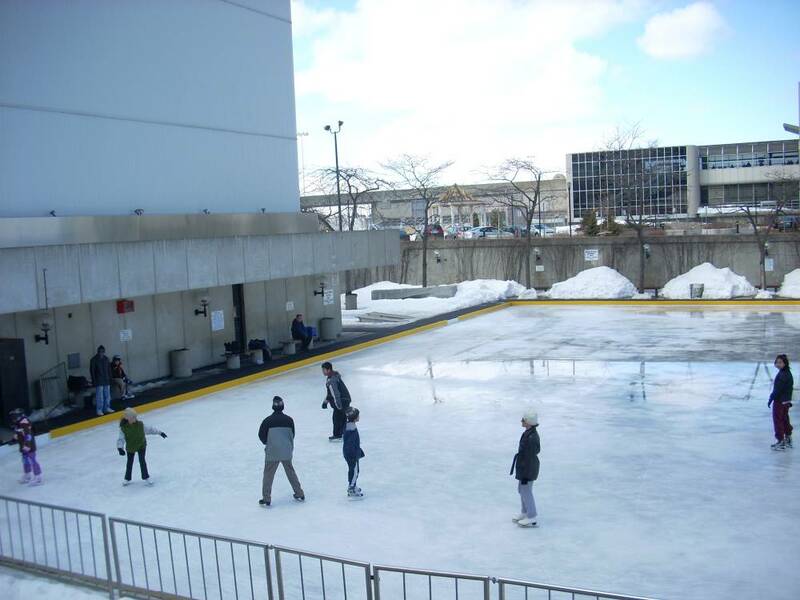 4 pm: The rink has 10 people pleasure-skating, one rink staff inside windowless office. Ice is not bad except very slushy on the south-facing side -- the brilliant sun has melted it down to a layer of leaves, but not -- apparently -- down to cement. 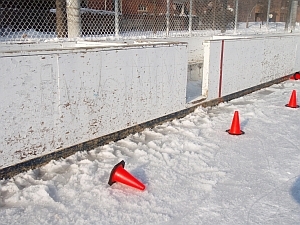 5:30pm Pylons have been placed along the boards on the north side of the rink where the ice is melting. 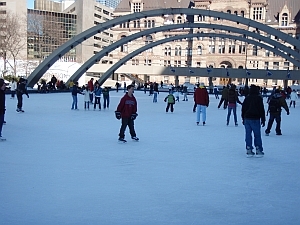 Most of the ice surface, however, is skateable. Twelve people are playing hockey, three adults and nine children. The children are wearing helmets, the adults aren't. 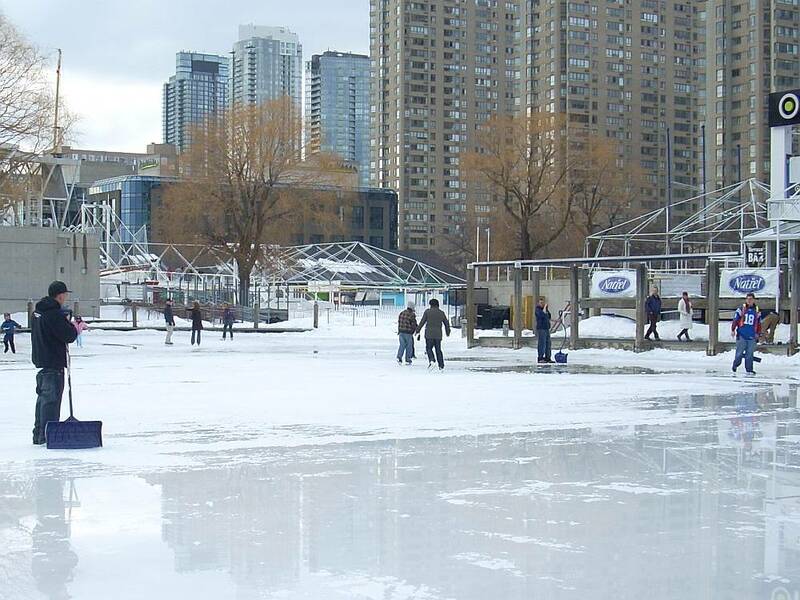 2:25pm There are 14 people on the ice, which is snowy but otherwise appears to be in good shape. 5:30pm A sign next to the staff room says Pleasure skating only, but in addition to 9 pleasure skaters, there are 4 boys playing hockey. The rink guard who is about the same age as the boys comes out and starts talking to them. They seem to be friends. The rink guard talks to one of the boys for a long time while the others continue playing hockey. One of the pleasure skaters is a child using a walker. He is wearing a helmet. The ice appears to be in good shape. There is a strong smell of marijuana in the men's washroom. 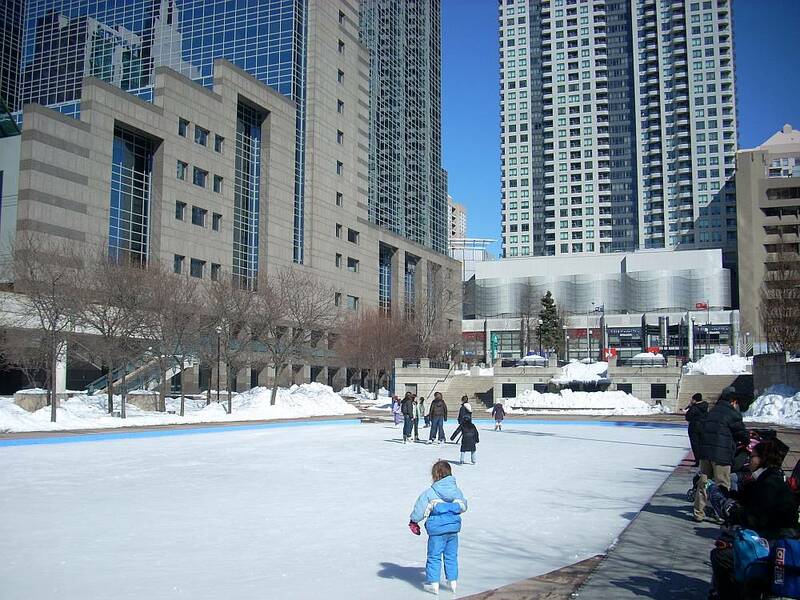 More skaters arrive and when CELOS leaves there are twenty people on the ice including the hockey players. 6 pm: Both pads are closed. 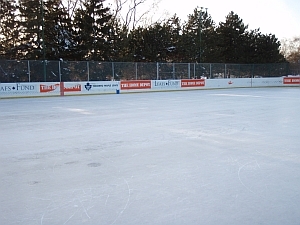 The hockey pad is watery at the south-facing end but otherwise looks firm. The pleasure skating pad is terrible, with many gouges right down to cement. 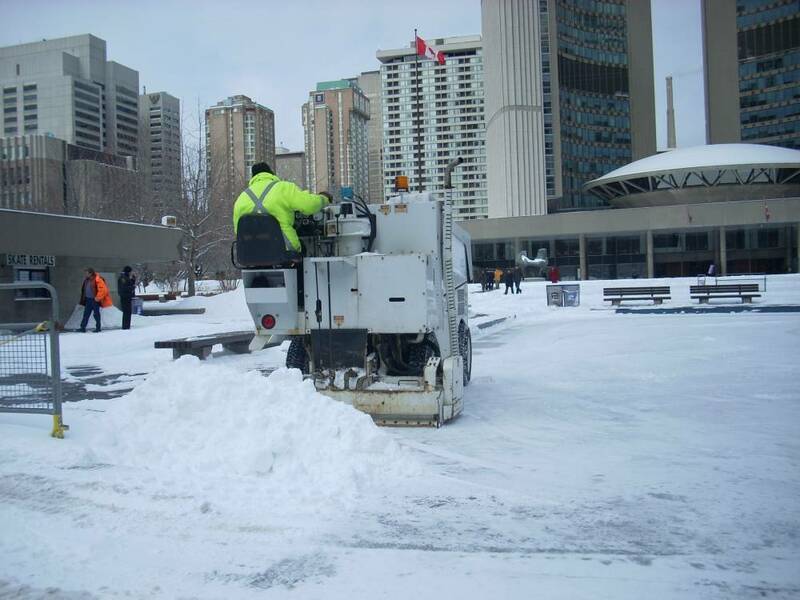 The zamboni operator looks unhappy that he had to close the rink, but says that a man fell twice, and it would be terrible if anyone got hurt by catching their skate on the cement. The operator also says that the temperature of the brine that's recirculating from the rink into the compressor room is 20 degrees Fahrenheit, almost the warmest he's ever seen. (Normally 10 degrees F.) That's the power of the sun, he says. "Maybe the weather will cooperate in the next few days and the sun will stay away." There are three other people sitting in the staff room, but the operator seems keen to stay out and chip away at the bumps with a snow shovel. A shinny player arrives, looking disappointed, and then the zamboni operator makes his day: "you can go on, just stay away from that wet area at the end." '1.30pm: 12 players on the hockey pad, all with helmets, and 10 on the pleasure pad, plus 9 in the change room. The ice looks okay on both pads. The front door to the change room is locked, even though it's the access from the bus stop right in front of the rink. People getting off the bus have to go all the way back and around by the parking lot, since only the inside doors are open. 3:20pm There are ten adults on the hockey pad. Three of the players are not wearing helmets. 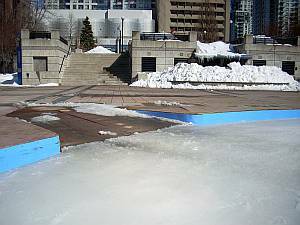 The ice is snowy and there's some melting right at the edge of the boards. (If you weren't looking for it, you wouldn't notice it.) 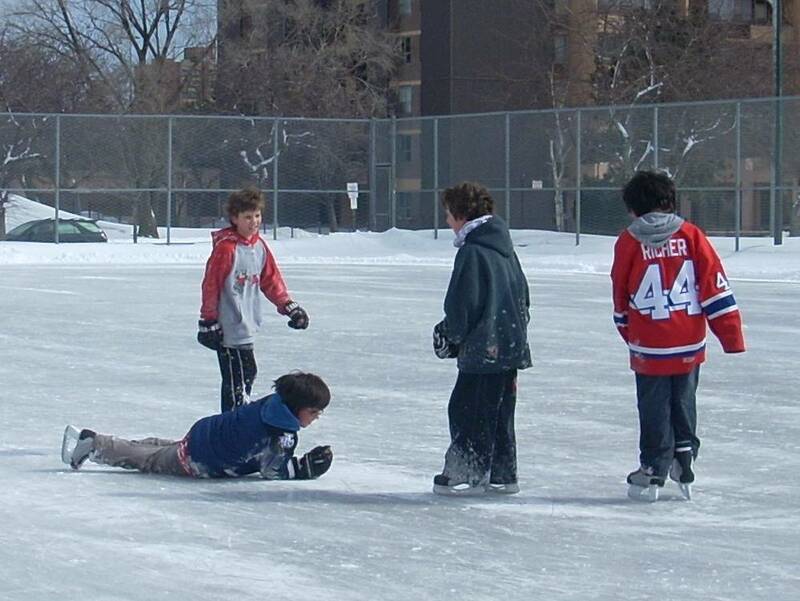 Otherwise the hockey pad is good enough for a fast-paced game of shinny. There are 8 skaters (parents and children) on the pleasure pad. The ice is hard and smooth. 11:30am There are 12 players on the hockey pad and two children on the pleasure pad. The ice looks good. The front doors to the rinkhouse are locked. Rink regulars know there is an open door to the changeroom on the rink side but someone visiting the rink for the first time might think the rinkhouse is closed. 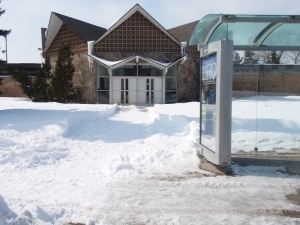 2pm The sidewalks on the West Mall are still covered in snow making it hard to walk to the rink from Burnhamthorpe. 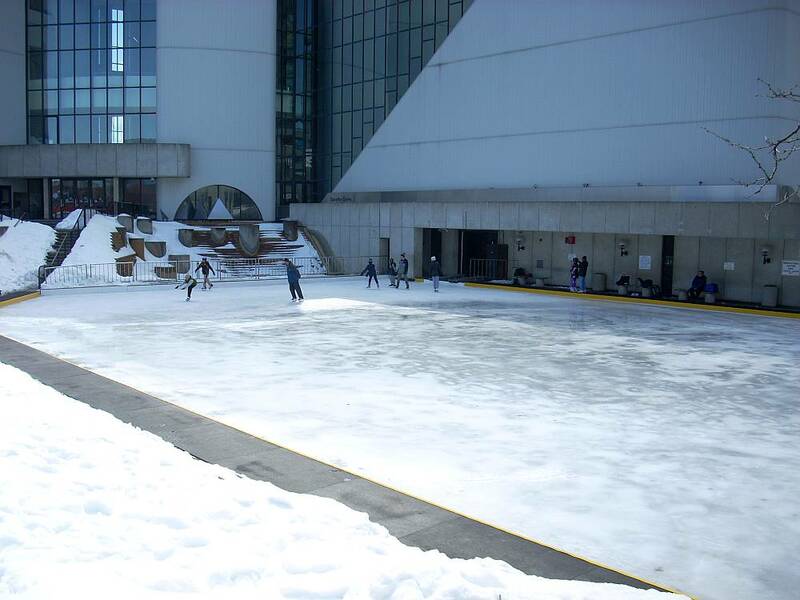 The rink, however, is open. There are three people, a man and two girls, on the hockey pad. There are four boys on the pleasure pad. 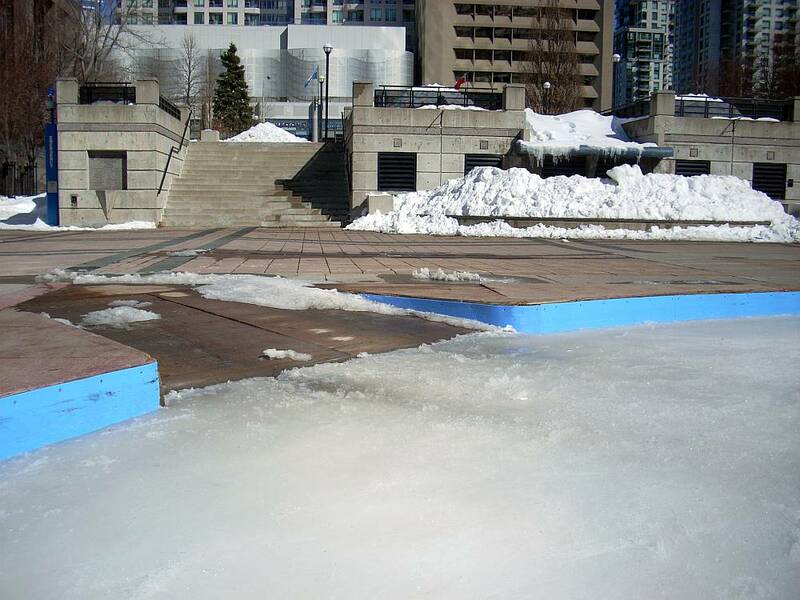 The ice appears to be in good shape, but there is some snow on the pleasure pad. A tractor has left some tracks on the ice. 9:30am The ice on both the hockey and leisure skating pads have been cleared of last night's snow. The Zamboni is just finishing the leisure pad when the CELOS researcher arrives. A team of young boys is having a practice on the hockey rink. There are two adult women and one child on the leisure pad. The front doors to the rinkhouse are locked, but one of the women says the changeroom is open. She came in by one of the doors next to the hockey pad. There are a few people putting on skates in the changeroom. There's no soap in the men's washroom. 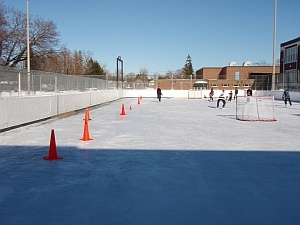 '5 p.m.: Rennie Rink staff say they've had to close the rink because it's full of water. 5 pm: 4 on hockey side (ice is good, just a bit mushy on the side) and 3 on the pleasure-skating side, even though the ice looks good there too. Two shinny players say they normally skate at Greenwood or Monarch, but have come to Rennie because it's one of the last rinks open. They also give the rink researchers a thrill by asking if we're from the "cityrinks" web site, which they say is the "bible" for shinny players. 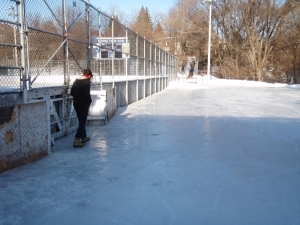 They say they wish the ice maintenance would be better in the east end rinks, but there are a few times when those rinks are sublime "but please don't post the times on the web site." So we won't. 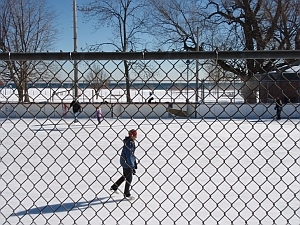 1 pm: rink has 15 on hockey side, mostly kids with two adults (no helmets), 8 skaters on the pleasure side. No staff in sight. 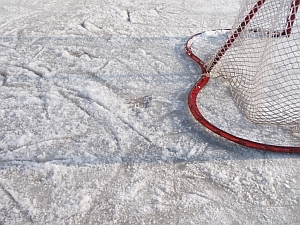 Ice is very thick (4-6 inches) and only mushy around the nets, solid otherwise. Some shade from the buildings and the trees -- this rink is fortunately in a hollow. 6.05 pm: rink ice is still good but has only two pleasure-skaters on freshly-flooded hockey side (they say the ice is too bumpy on the pleasure-skating side). 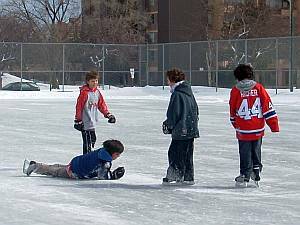 One kid skating on the pleasure side says there are few kids who come to play hockey because "hockey season's over." 2pm Two-thirds of the rink surface is a lake unsuitable for skating. There are ten skaters on the remaining third. During CELOS' visit skaters co come and go, but many don't stay long because there isn't enough room to skate.